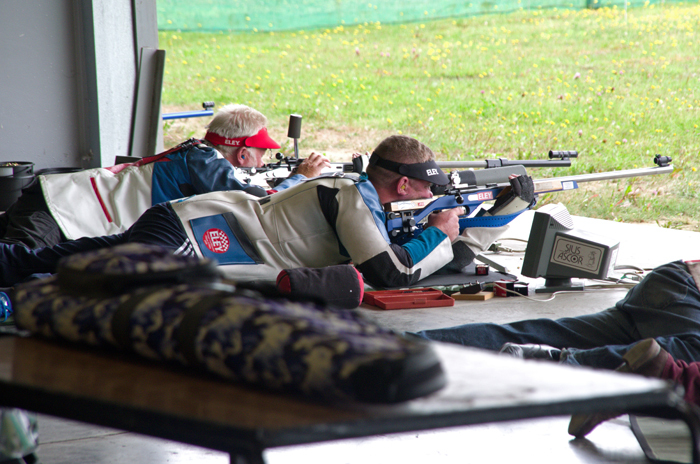 The above photograph shows Martyn Buttery, pictured right, competing in the Champion of Champions Competition 2014 at Bisley. 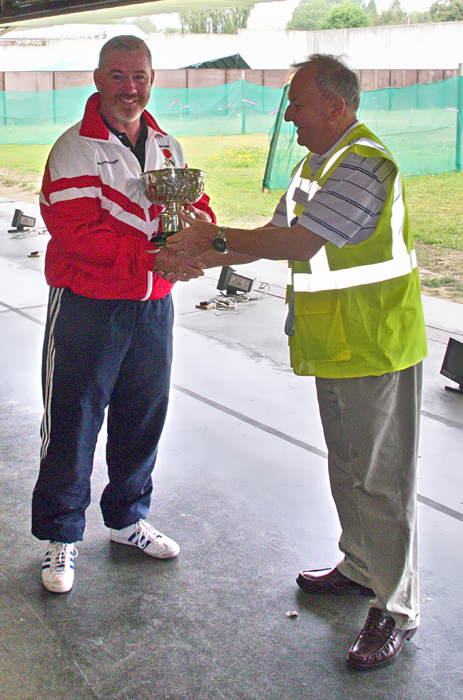 The above photograph shows Martyn Buttery, pictured left, receiving The F.G. Troke Rose Bowl for 2014 from Mike Willcox. The above photograph shows Martyn Buttery, pictured left, receiving The F.G. Troke Rose Bowl for 2014, from Mike Willcox. 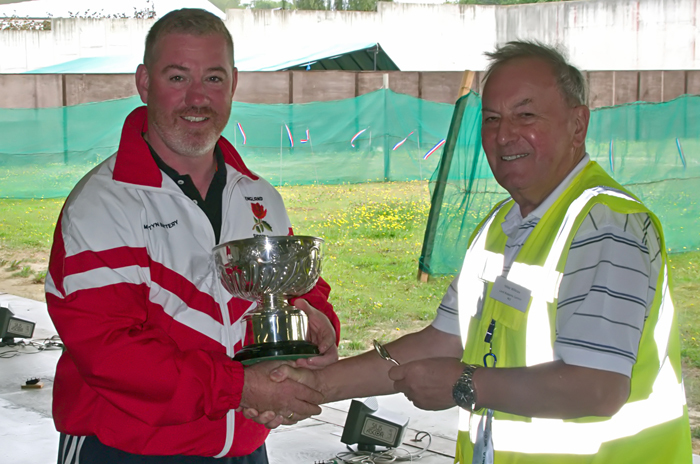 Martyn Buttery, of Rugeley Rifle Club, received the F.G. Troke Rose Bowl at the Champion of Champions Competition 2014 at Bisley. This was awarded to Martyn for representing Staffordshire in the Champion of Champions Competition at the Bisley National Meeting. All the competitors who participated in the Champion of Champions Competition are at the top of their game, and so for Martyn to finish in 10th place overall was no mean achievement. Congratulations to Martyn, from all connected with Staffordshire Smallbore Rifle Association. Take a moment to view the previous winners of the F.G. Troke Rose Bowl. The above photograph shows SSRA President Peter Martin and his wife Margaret with a beautiful 65th Wedding Anniversary Cake, and a very special card from Her Majesty The Queen. On Wednesday 25th June 2014, SSRA President Peter Martin and his wife Margaret celebrated their 65th Wedding Anniversary. 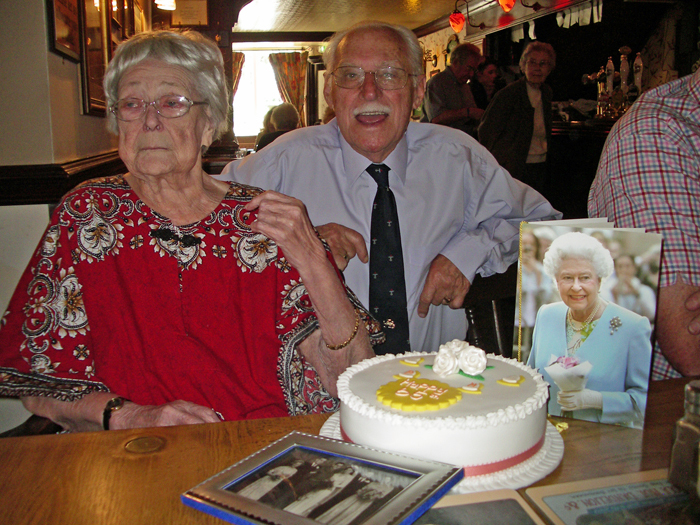 The above photograph shows Peter and his wife Margaret enjoying their special celebrations with a beautiful 65th Wedding Anniversary Cake, and a very special congratulatory card from Her Majesty The Queen. All associated with the Staffordshire Smallbore Rifle Association send their sincere congratulations to Peter and Margaret on the occasion of their 65th Wedding Anniversary, and wish them all the best for the future. If you look closely at the updated panoramic photograph of the Chipperfield Ranges, shown above, you may notice that there is something a little different when compared to the same viewpoint from a few months ago. 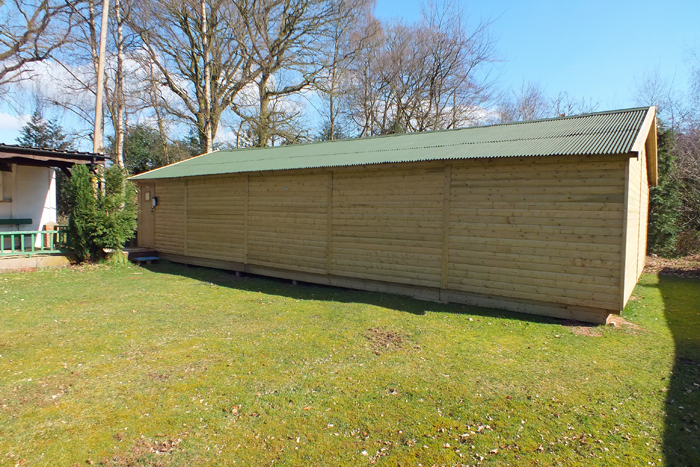 Are you still wondering what the recently added construction is that sits between the clubhouse and the outdoor range? Why not take a closer look at the photograph below and see if you can work it out. Are you still unsure as to what this structure is? Visit the Facilities webpage to see just what lies inside this mysterious building. To view a selection of the stories and updates from throughout 2018, please visit the News Archive for 2018. To view a selection of the stories and updates from throughout 2017, please visit the News Archive for 2017. To view a selection of the stories and updates from throughout 2016, please visit the News Archive for 2016. To view a selection of the stories and updates from throughout 2015, please visit the News Archive for 2015.